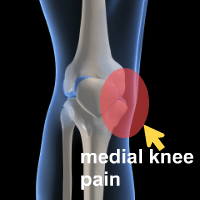 Description:- Pain on the inside (or medial) area of the knee is present for a number of reasons. Ranging from a mild medial ligament strain to medial compartment arthriits (medial meniscal arthriitis). Medial collateral strain/tear:- Often after a twisting movement usually when playing sports that require short sharp movements this injury can occur. a planted football stud follwed by a twist or a tackle can often result in this type of injury. A relatively sharp pain particularly when trying to turn is felt, swelling may also be present. Rest, Ice, Compression and Elevation is required with a Physiotherapy assessment would be recommended, as well as knee bracing to protect the ligament either in the stages of heling ro to prevent future damage. More serious ligamentous injuries may also have instability in this area and requires urgent assessment and diagnosis to check the level of injury present.